The early 80s were something of a golden age for the fantasy film genres, and few movies were as imaginative, or ambitious, as these two inventive films from puppet master Jim Henson. 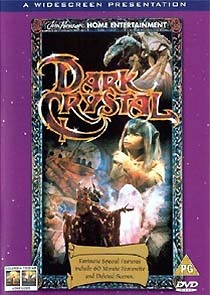 The Dark Crystal, from 1982, features a storybook fantasy world populated entirely by strange creatures. The film has never looked nicer in any of its various home video incarnations, and comes highly recommended, especially to anyone who’s never seen it in it’s original widescreen ratio (2.35:1, here enhanced for 16:9). The sound has been given a thorough overhaul, too, and is now presented in 5.1 channel Dolby Digital. The DVD is stuffed with extra features, including a terrific hour-long contemporary behind the scenes feature, The World of the Dark Crystal, and eight deleted scenes (or early versions of scenes) taken from a low-quality work print. Only the Region 1 version of The Dark Crystal features Trevor Jones’ baroque score isolated in digital stereo, however, which was a significant bonus to soundtrack fans before the film's score was finally officially released on CD, in 2003 by Numenorean Music. (In fact, the Complete Film Score section of the two-CD set was taken from the DVD's isolated score track. The music on disc one is the music from the original LP masters). 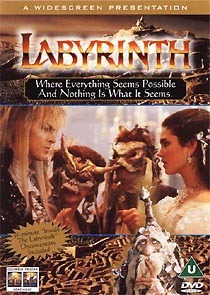 George Lucas was the Executive Producer of 1986’s Labyrinth, the story of a young girl (Jennifer Connelly) whose baby brother is kidnapped by goblins. In her journey she encounters many odd creatures, ala Alice’s Adventures in Wonderland. The new DVD version presents the film in anamorphic widescreen ratio, enhanced for 16:9 TVs. The sound is 2.0 channel Dolby Digital (at 256kbps), expanding the film’s ambience and giving more weight to Trevor Jones’ score. Note that the sleeve claims the audio is 5.0, but it isn't. The disc also features a contemporaneous fifty-seven minute behind-the-scenes documentary, Inside The Labyrinth: a real treat for fans of the movie or anyone interested in animatronic effects. Superbit versions of both films are available (both stripped of bonus materials), as an alternative, offering marginally improved picture quality, and DTS audio tracks. UPDATE - Special Edition re-releases of both films are also now available.